HSA SCUBA Diving with Gabrielle in Tallahassee, Florida and Around the World! Gabrielle has been a SCUBA diver her entire adult life. She has a passion for diving and loves to teach people how to overcome any challenges to enjoy the world from a different perspective- one that few ever get a chance to experience. When trained properly, SCUBA diving is an extremely safe, rewarding, and fun sport. You will forget all your stresses when you are breathing underwater, soaking in the amazing sights around you! People with disabilities can often enjoy SCUBA diving despite any physical limitations. Following medical clearance by your doctor, you will learn to experience diving regardless of your different abilities. Water is invigorating and healing...don't let anyone (except your doctor :) tell you that you can't dive, too! People with disabilities, learn to SCUBA dive with Gabrielle, an instructor certified through Handicapped SCUBA Association (HSA). Water is wonderful and healing! 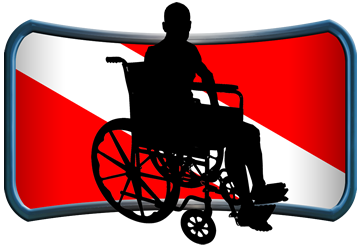 There are three levels of certification for divers with disabilities through HSA. Either from accident or disease, about 15% of the population is classified as having disabilities. In the U.S. alone, this translates to millions of people, many of whom are fully capable of becoming SCUBA divers. Our open water training programs for people with disabilities are taught with a high margin of safety because we use teaching techniques developed with over 20 years of research and feedback. Students with disabilities are trained and certified according to HSA Physical Performance Standards and a multilevel certification system so exacting and sensitive that it enables us to train people with a wide range of disabilities including paraplegia, quadriplegia, blindness, and those with high-functioning brain injuries or mild retardation. We base our students’ diving proficiencies on their abilities to assist another diver in the water. For instance, if you are a Level A diver, you are certified to dive with one other person; a Level B diver must dive with two other able-bodied divers, and a Level C diver not only requires two dive buddies, but one must be trained in diver rescue. The third member of the buddy team is not there to further assist the B or C Level diver but rather to ensure the safety of the A Level or above diver that cannot be assisted by the B or C Level diver. HSA Level B or C divers are certified as recreational SCUBA divers and do not have any sport diving restrictions. Also unique to our training system is Marine Life Identification. Our Open Water SCUBA Diver course requires that one marine life form be described and identified on each of the students’ five certifying SCUBA dives. After meeting the performance requirements for Open Water SCUBA Diver, some of our A, B, and C divers go on to obtain an "Advanced" level of certification. That is HSA Level A, B, and C certified divers can earn an HSA Advanced certification. Upon completion of the HSA Advance Course, the diver will have developed the skills necessary for planning and executing SCUBA dives typical of recreational diving. They will also develop a further awareness and appreciation for the Marine Environment, its inhabitants, and the delicate balance of the ecosystem that supports them. Many of us know a friend or family member we'd like to involve in SCUBA diving. Or, we'd welcome the challenge of learning about disabilities, accessibility issues, and how to dive with people who have disabilities. The HSA "Dive Buddy Program" offers able-bodied divers this opportunity to expand their underwater world to include sharing it with a buddy with disabilities. An HSA certified Dive Buddy receives nearly as much information and skill training as an instructor, except the training focuses on recreation, not instruction. Handicapped SCUBA Association (HSA) is an international organization that pioneered efforts to include people with disabilities in this amazing sport. The training takes longer and the ratios are typically one on one, but divers with disabilities will become competent, safe divers.